Filing taxes in the midst of a divorce, as well as once the divorce is finalized, raises issues most people would not consider. Before filing a return, it is important to consult with your attorney and accountant to ensure you are making the appropriate selections, and to address any state-specific tax laws. Dividing the assets is one of the biggest parts of divorce. Before filing, or shortly thereafter, you should complete a spreadsheet of all of you and your spouse's income, assets (and their values) and debts. This not only helps make it easier to begin figuring out the value of the marital estate and serves as a starting point for how it should be divided, but will also make it easier to file tax returns, because all the asset information is in one place. Along with the spreadsheet you should keep copies of all records related to income, deductions (such as education and medical expenses) and investments, all of which you'll need when it comes time to file. Having these all on hand makes it easier for you or your accountant to ensure that you are reporting all income and getting the maximum deductions you're allowed. During the divorce proceedings, you may feel as though your marriage has officially ended - you and your spouse are slowly moving on with your lives, and have little to no contact outside of court and picking up and dropping off the children for visitation. However, until that divorce decree is signed, the IRS holds both spouses responsible for taking care of your joint tax obligations. How do you handle filing taxes while you're in marital limbo? Common issues that divorcing couples face include what filing status to use, how to handle claiming dependents and child tax care credits, and paying joint tax obligations. Jointly - Most couples file a joint tax return, which is typically the option used during the marriage. You and your spouse will file your taxes exactly as you have been throughout the marriage. Married filing separately - If you choose this option, each spouse files only her income on the tax return, and can only claim those benefits and deductions applicable to them. Your accountant can help you determine which of these benefits would be most advantageous. If you choose to file a joint tax return, dependents are claimed on the income tax return as usual. If, however, you and your spouse choose to file separate returns, you must decide which parent will claim the children as dependents. Usually, the custodial parent claims the child. Sometimes however, it is more advantageous for the non-custodial parent to claim the child. If this happens, the custodial parent must complete IRS Form 8332, which authorizes the non-custodial parent to claim the child. If you choose to file separate tax returns, child support payments are not deductible by the parent paying them, nor are they required to be reported as income by the parent receiving them. However, for separate returns each parent is entitled to deduct any medical and child care expenses she pays on the child's behalf, regardless of who claims the child as a dependent. If you and your spouse choose to file a joint tax return during the divorce, you will continue to be jointly liable to pay any taxes owed. From property division to alimony, the divorce can have lingering effects on future tax returns that you need to be aware of to ensure you don't run afoul of the IRS. 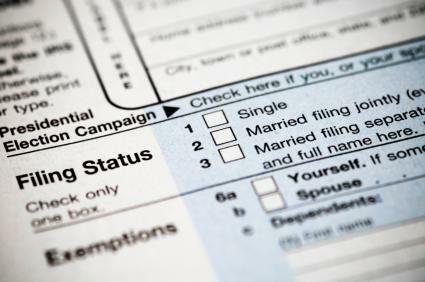 Once the divorce is finalized, your filing status for income tax purposes is determined by your marital status as of December 31 of the filing year. This means that if your divorce was finalized prior to December 31 for the year you're filing taxes - even if the decree was signed December 31 - you may only file as single or head of household. The custodial parent usually claims the children as dependents for income tax purposes. If the parents have joint custody, they may agree to alternate who claims the child. In some situations, the parties may agree that the non-custodial parent will take the credit. This may occur in cases where the non-custodial parent would receive a greater tax benefit for claiming the child, or if the custodial parent gave up the dependent exemption in lieu of some other benefit. In these cases, the custodial parent must sign IRS Form 8332 and waive the right to claim the child as a dependent. Child Tax Credit - Tax credit of up to $1,000 per qualifying child. To qualify, a child must six criteria regarding age, relationship to person claiming the credit, support, dependent status, citizenship, and residence. Exclusion for dependent care benefits - Expenses up to $3,000 for one qualifying dependent, or $6,000 for two or more, can be used to claim the credit. Qualifying dependents include children under the age of 12, or a spouse or other dependent who is physically and mentally incapable of self-care. Expenses must have gone toward allowing the parent to work or look for work. Earned Income Credit - Credit offered to taxpayers with income below an annual threshold. The amount of the credit increases if you have dependents. The child tax credit can only be taken by the parent who claims the child as a dependent on his income tax return, so if the custodial parent waives her right to claim the child as a dependent, she also waives the right to take this credit on her income tax return. Only the custodial parent can claim the dependent care exclusion. While either parent can take the earned income credit if they meet IRS criteria, only the custodial parent may claim the child as a dependent for the purpose of increasing the amount of the credit they are entitled to. Child support cannot be claimed as an income tax deduction by the parent who pays them, nor are they counted as income by the parent who receives them. However, medical expenses paid on the child's behalf can be deducted (provided all other IRS criteria for medical expense deductions are met), regardless of whether the parent who paid the medical expenses claims the child as a dependent. Alimony may be claimed as a deduction by the spouse who pays it, and must be reported as income by the spouse who receives it. Before claiming the deduction, it is important to make sure that the payment is actually considered alimony. Generally, for a payment to be considered alimony, the divorce decree must specifically state that it is alimony. Dividing property may have tax implications, especially if you choose to transfer assets between spouses rather than sell it. It also has the potential to leave you on the hook for your ex-spouse's debts. Capital Gains Tax - A transfer of assets pursuant to a divorce is not a taxable event. However, the spouse who received an asset in the divorce will be solely responsible for paying any capital gains tax that is owed at later sale, even if the majority of the asset's appreciated occurred during the marriage. Likewise, if you sell the property for a loss and receive a tax refund, your spouse is not entitled to the benefit. Division of Debt - Just because your ex-spouse was awarded the family home doesn't necessarily mean you can't be held responsible for the mortgage. If your name is listed on the mortgage - or any other asset that has a repayment obligation, such as a credit card or loan - you can be responsible for the outstanding balance if your ex-spouse fails to fulfill his payment obligation. That is why it is important for the divorce agreement to require your spouse to take all steps to refinance the loan or remove your name completely, so that you have no liability if he becomes delinquent. Attorney's fees associated with the divorce are not deductible; however, fees for tax preparation or tax advice can be deducted. This means you can deduct accountant fees and, if your attorney is willing to provide a complete breakdown of his time, any fees associated with obtaining tax advice during or following the divorce. Divorce brings up a number of tax issues you never had to worry about while married, and they can have a huge financial impact if handled incorrectly. Whether married or divorced, preparation and planning are key when it comes to filing taxes. Make sure all of your financial documents are in order and seek the advice of competent legal and tax counsel to ensure you properly file your return and receive the maximum refund.